Peanut butter is low in carbohydrates, rich in unsaturated fat, and filled with protein—and research shows that a limited amount of all-natural peanut butter can be beneficial for diabetics! Peanut butter’s low-carb content will help keep the blood sugar levels under control, and keep you feeling full and satisfied. The right amount of peanut butter can provide a healthy and delicious snack for diabetics and help decrease the risk of diabetes and its complications. 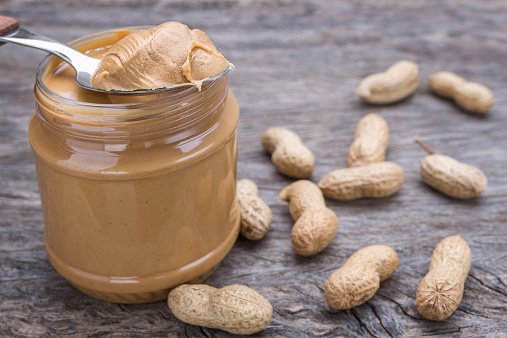 Peanut Butter 101: What Makes Peanut Butter So Nutritious? Natural peanut butter with no added sugar, fats, and sweeteners is a nutritional powerhouse. Just two tablespoons of peanut butter contains 12 grams of natural, healthy poly- and monounsaturated fats, and almost eight grams of rich protein. Peanut butter contains no cholesterol, less than seven grams of carbohydrates, and almost no saturated fat, making it beneficial for those with diabetes as well as cardiac issues. Keep in mind the American Diabetes Association insists that people who have diabetes should never consume more than two tablespoons of peanut butter in one sitting. But two tablespoons is a good amount—it contains less than 200 calories and averages to about 10% of your daily calorie consumption. Instead of white bread, spread two tablespoons of peanut butter on some fruit, whole grain crackers, or a slice of whole grain toast. Diabetics should always read the ingredients and labels of anything they purchase in order to make sure that hydrogenated oils haven’t been added to the product. The crucial element to managing your diabetes is a proper diet; it is the key component to preventing your type 1 diabetes from becoming type 2 diabetes. In a study that was done at the Harvard School of Public Health, researchers discovered that the risk of type 2 diabetes decreases the more regularly peanuts and peanut butter are eaten. Participants who consumed about one ounce of peanuts or one tablespoon of peanut butter between one to four times daily reduced their risk of developing type 2 diabetes by 10%. Those who consumed the same amount of peanuts or peanut butter more than five times daily saw their risk reduce by an astonishing 25%. In addition, those who consumed red meat and replaced it with peanuts or peanut butter saw their risk reduce by 21%. Let’s take a look at the glycemic index in regards to blood sugar levels. The glycemic index is the scale that ranks foods from 1 to 100; it’s based on their effect on blood sugar levels after food consumption. The higher the GI is, the higher the risk of blood sugar levels rising after food consumption. Slowly-digested foods, which tend to gradually release sugar into the bloodstream, tend to have a lower GI. Peanuts have a GI of 14, which makes them a low GI food. Low GI foods can actually help control glucose levels for people with diabetes. Extensive research has revealed that peanut butter can help reduce the spike in blood sugar if it is paired with high carbohydrates, or high GI foods. Another 2013 study published in The British Journal of Nutrition illustrated that if peanut butter is consumed in the morning, it can have a positive effect on the blood sugar levels for obese women with a higher risk of developing type 2 diabetes. When the participants in the study consumed three tablespoons of peanut butter with their breakfast, it decreased their blood sugar levels more than when they didn’t have peanut butter with breakfast. When they included the peanut butter, these women also had less desire to eat again for up to 12 hours afterward. Natural peanut butter is healthy and beneficial for diabetics, but many store-bought manufactured peanut butters are not as nutritious. Even “low-fat” peanut butter isn’t healthy—to sweeten the taste of the low-fat peanut butter, manufacturers typically add more sugar. Added sugar can increase the carbohydrate content and cause the blood sugar levels to rapidly rise. If you purchase the cheaper, more lower-end peanut butter, you will be purchasing peanut butter with hydrogenated oils or trans fats that have been added to them; this is bad because diabetics should never be consuming trans fats. However, the right kind of peanut butter is rich in protein and unsaturated fat— it’s no wonder it has been called a powerhouse nutrient. It’s easily portable and takes little to no time to prepare. The best part is that you can mix it with many different types of foods and reap all of its nutritional benefits. As long as you buy natural peanut butter, you can help decrease your risk of developing type 2 diabetes. Keep in mind that you do not solely need to rely on peanuts or peanut butter to keep your blood sugar levels at bay. Make sure to exercise and follow a strict diet; peanut butter will merely complement the rest of your lifestyle. Winston, C., “Can Diabetics Eat Peanut Butter?” Healthy Eating web site; http://healthyeating.sfgate.com/can-diabetics-eat-peanut-butter-5525.html, last accessed June 26, 2015. “Diabetes and Blood Sugar,” The Peanut Institute web site; http://www.peanut-institute.org/health-and-nutrition/disease-prevention/diabetes-and-blood-sugar.asp, last accessed June 26, 2015. Yacoub, J., “Will Peanut Butter Lower My Blood Sugar Level Fast?” Livestrong.com, June 24, 2015; http://www.livestrong.com/article/492531-will-peanut-butter-lower-my-blood-sugar-level-fast/.